Bill's Stick Caddis is a cased-caddis larvae pattern designed by the late Bill Carnazzo, a guide of West Slope Sierran Streams. The pattern is designed for the October Caddis larvae which inhabit most of the West Slope rivers and streams. 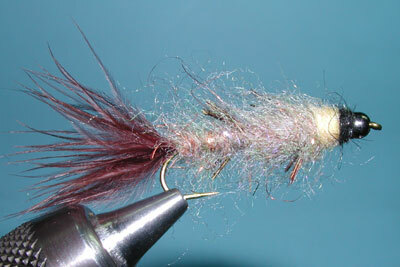 He developed this pattern while fishing on the North Fork Yuba. Many trout key on the October Caddis hatch in late September and October but the larvae can be fished at any time during the season. A number of aspects to this fly make it a good one. One is the simplicity of the fly itself. The fly consists of relatively few materials which are tied in a progressive manner from tail to head. These materials are selected to mimic the actual larvae and tied with a degree of fuzziness to deliver movement and life to the fly. The pale yellow collar is of particular importance since it creates a trigger response to the fly as the trout focus on what appears to be the caddis larvae body. The fly is also weighted by both the bead and the lead-free wire wraps to ensure that the fly remains close to the river bottom. Select the size of bead and wire to fit the hook. For instance, on a size 6 hook, 0.30" lead-free wire will work well in filling the space behind a 3/32" bead but this may be too large for a size 10 hook. The October Caddis larvae will often get dislodged from the bottom material in which the case is attached to. As the larvae case tumbles through the stream bed, the larvae will extend it's body and legs reaching out for a new hold. Trout will notice this tumbling case and make a striking reponse, particularly when it sees the body and legs extending outwards. The case is made up of sand grit, twigs, and pebbles. Bill suggests a blend of Dark Brown dubbing with Orange Antron, and Copper Lite Brite. He often prefers to use Paxton's Dark Brown Nymph Dubbing. He utilizes Pheasant Tail fibers to produce the effect of small twigs extending from the case. As the season comes closer to October, Bill changes the body color from Pale Yellow to Pale Orange.He calls this the "Fall Phase Stick Caddis". He also uses a "Gray" version to adjust the pattern to the material available within the stream. 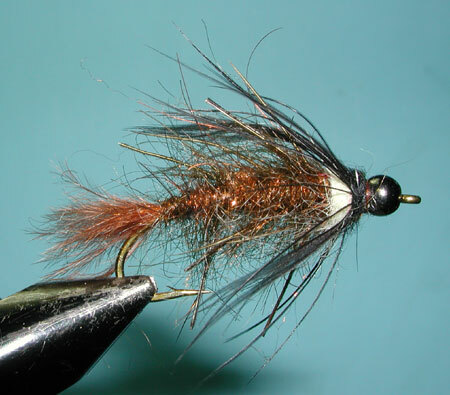 On the "Gray" version, Bill trims the Pheasant Tail fibers closer to the body to resemble small brown pebbles and adjusts the dubbing colors to a Greyish blend. This coloration works better on streams such as the Truckee, where vegetation is minimal. The legs are optional. 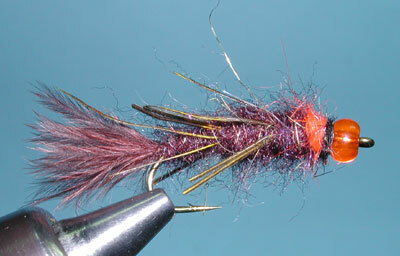 When Andy Burk featured this pattern in Aug 2006 California Fly Fisher, he tied the legs in a soft hackle technique with a collar wrap of 3 turns. Bill followed up with an article in the October 2009 issue, indicating that this step was optional and, if used, could be tied nymph style. The other variations you will encounter with this pattern is the choice of hook styles. Earlier versions included curved nymph hooks such as TMC 200R and Daiichi 1260, later TMC 300 was recommended. You may also see the Paxton's Buggy Nymph dubbing cited as the choice material. However, in 2002, Tim Paxton sold his line of material and it is no longer distributed. Umpqua markets a very similar material.